In this paper, we will focus on a theoretical study and its application to a concrete site. We will try to answer the question: How can we optimize the implementation of horizontal trackers on a solar plant? Each solar plant is sized and equipped accordingly to site and client constraints. In order to ensure an efficient implementation of the PV array, developers consider both technical and financial aspects, such as the orientation of PV modules, the ground coverage ratio and the number of auxiliary equipments or the wiring infrastructures. In this paper, we will focus on a theoretical study and its application to a concrete site. We will try to answer the question: How can we optimize the implementation of horizontal trackers on a solar plant in order to maximize its yield and reduce the Capex? 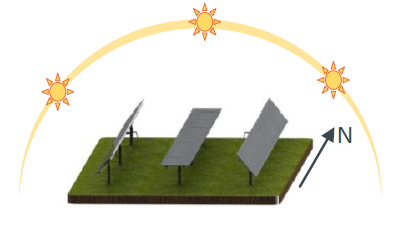 The Ground Coverage Ratio (GCR) is the ratio between the PV modules area and the total ground area. It defines the East-West distance between the Exotrack® HZ tracker tables. All these tables are generally designed for a North-South direction implementation, in which case the orientation parameter value is 0°. We chose to focus our attention on a site located in the South East of France, near Marseille (Global Horizontal Irradiance: 1577 kWh/m²), to study the influence of the GCR and orientation parameters on the specific production. We can observe that the yield decreases linearly while the GCR is increasing, whatever the orientation. Between 33% and 50% GCR, the yield gap reaches 86 kWh/kWp, which represents a drop of 5.5%. The orientation parameter has less influence on the specific production; between 0° and 10°, the yield difference is about -0.3% and from 0° to 30° the difference reaches -3.1%. The GCR is more influent on the yield than the tables’ orientation. Tables can be slightly rotated from South to decrease the GCR and improve the implementation. Two different schemes of implementation have been compared on an actual case near Kenitra in Morocco. The first configuration is composed of 13 trackers on a North-South axis (Orientation 0°), and the second one is composed of 12 trackers on a South to East axis with a 25° orientation. In both cases, the GCR and the total DC power of the PV plant (2 MW) are the same. This region receives an immense amount of solar energy which reduces the influence of the orientation parameter. 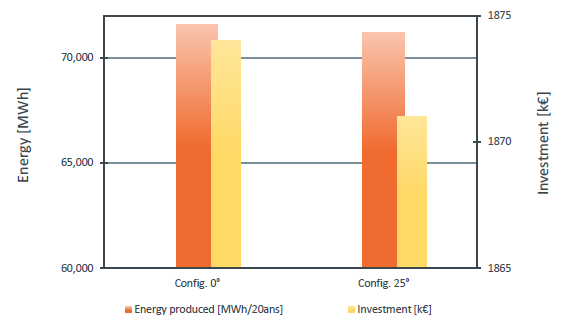 The yield gap between the two implementations is only 10 kWh/kWp (around 0.6 %). This small loss can be greatly compensated by lower infrastructure work, auxiliary equipments and O&M costs. With the 25° configuration, the trench constructions are considerably easier, since all the drive motors of the trackers are located on the same virtual line. In comparison to the 0° configuration, the trench is 50 meters shorter and only 6 drive motors are needed against 7 for the other implementation. Moreover, the 25° configuration requires 24 junction boxes, used to connect DC wires to the delivery substation, against 25 for the other implementation. Other parameters like the number of auxiliary equipment or the infrastructure works for example, influence the global cost. We must therefore compare the results of all possible strategies on the system’s lifetime. According to financial data, maximizing the yield isn’t the only criteria for optimization. Rotating tables from the South slightly decreases the yield, yet significantly improves the implementation of all the wiring infrastructures. Sometimes, changing the orientation leads to the best scheme of implementation. Exotrack® HZ horizontal single-axis trackers are easily adaptable to several field orientations. As a leading solar engineering company, Exosun designs, develops and supplies a range of patented solar tracking systems for ground mounted utility-scale PV plants delivered with a full range of product associated engineering support services. In parallel, Exosun is highly involved in the R&D of future solar technologies.